HELP…I got into a Ponzi Scheme and I Can’t Get Out! I was an innocent victim. Through no fault of my own, except perhaps because I elected to work, I might be involved in one of the largest Ponzi schemes in history… my government’s Social Security program. You decide!! When Franklin Delano Roosevelt created the program, he saw it as a way for worker’s to “…legally ethically and politically collect their pensions and unemployment benefits.” But is that what truly is happening? 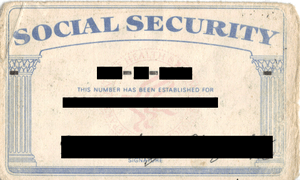 There is a great deal of confusion as to the truth about Social Security. Some people think that we are being lied to about the solvency of S.S. indicating that there is actually a surplus of money in the account which continues to grow. Others emphatically state that the system will be out of funds within the next 20 to 30 years.http://www.hermes-press.com/sss1.htm. Is the bigger scheme not knowing who or what to believe when it comes to the money you earned? Did you know that if two spouses work all of their lives, that if one spouse passes away, the other spouse can only collect the higher of two incomes, not both? An IRA, KEOGH, or other investment will let me to choose a beneficiary but my S.S. decides for me. Congressmen did not have to pay into S.S. until 1984 and even without their contributions, their government pensions will far surpass what most people will ever get in a monthly S.S. check. Almost a year ago, a friend with a serious disease who is unable to work consistently applied for Social Security. He is still waiting to see if he qualifies for the money he “loaned” the government. Social Security funds wars and bails out banks. Is that wrong? Banks and funds with our other investments use our money similarly? How about you? Do you feel lied to and believe there will be funds for you when you are ready to enjoy retirement? Do you think you will need to work until you take your last breath? Are you skeptical of anything your government does whether local,state or national or do you believe in the greater good? It’s your life what are you letting someone else DO about it? This entry was posted in Uncategorized and tagged Christian, Government, Ponzi scheme, Social Security, Uncategorized. Bookmark the permalink.